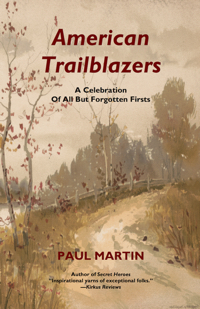 American Trailblazers celebrates a group of lesser-known Americans who left an enduring imprint on their time through their milestone innovations or inspirational accomplishments. These men and women come from every period in our nation’s history and all walks of life—from humanitarians, adventurers, and entertainers to political figures, inventors, and entrepreneurs. However, what really makes these people worthy of note are their memorable life stories. Many of these individuals could be deemed heroes, others colorful iconoclasts. One or two might even be considered controversial, although their attainments were important nonetheless. The characters are organized into two groups representing the fields in which they excelled—Culture and Society or Science and Industry. Among those featured is fearless Quaker housewife Mary Dyer, who was hanged in Massachusetts in 1660 while fighting for religious freedom. There’s Boston teacher James Lovell, a long-standing member of the Continental Congress who helped America win the Revolutionary War by serving as the country’s first expert on codes and ciphers. There’s Henry Wellcome, who grew up on the Minnesota frontier and went on to run a groundbreaking London-based pharmaceutical company that developed drugs to fight leukemia, viruses, allergies, and countless other conditions. More recently, there’s Leo Baekeland, who changed life forever with the invention of the first commercially successful synthetic plastic, and H. Edward Roberts, the father of the personal computer, a maverick who sold his company to study medicine and become a Georgia country doctor. There’s also Daniel Decatur Emmett, leader of the first minstrel troupe, whose shockingly racist show launched one of the most popular forms of entertainment in the nineteenth century, a spectacle that has had enormous and lasting impact on American culture, for bad and good. From the pregnant nineteen-year-old heroine who took command of a clipper ship in distress in the dangerous waters off Cape Horn to the scientist who invented modern forensic toxicology, these trailblazers fix themselves firmly in our imagination with their mesmerizing stories.